I was born in St. Thomas Swansea in 1955 and lived and worked most of my life in Swansea and South Wales. I am married to Andrea since 1975 and we have four grown up children and one grandchild. I worked in retailing, ( H Samuel and Tesco's ) and training ( Employment Services) and have been a Christian since 1993. 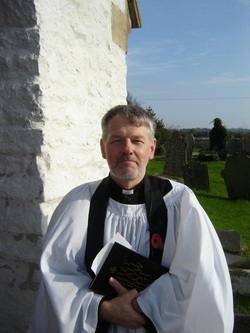 I began training for the ministry in St Michael's Theological Colllege Llandaff in 1997 and was Ordained the curate of Morriston in 1999 and served there until 2001 when I moved north to Radnorshire to become Vicar of 8 churches around the Market town of Rhayader and the Elan Valley Dams. I returned to Swansea in 2011 to become Vicar of the newlly formed Parish of Three Cliffs an exciting and challenging opportunity for ministry in the South East Gower. I promise to help you in whatever way I can. Mary is a married mother of three young children who was ordained in 2012 after training in St Michael's College Llandaff. She brings a variety of special gifts to her first ministry post.